Magma cookware – Live MoHo! When we set out, we needed a set of cookware for the MoHo. There were several criteria for us, starting with size, durability, and NO TEFLON. When heated, Teflon is toxic. It causes something called “polymer fume fever” that leads to flu-like symptoms in people who breathe the fumes in confined spaces. Like, oh, say, in a MoHo. 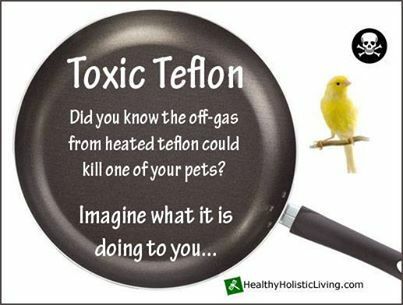 But while Teflon fumes only make people sick, they actually kill birds. Quickly. So any cookware for us had to be Teflon–free. We looked at many options but it became clear that Magma offered exactly what we were looking for. They make high-quality cookware for RV and marine customers. The company is based in the USA (YAY!) and was founded in 1976 by California twins and sailors Jim and Jerry Mashburn who got tired of their grill rusting and pitting on their sailboat. They tried many different brands of porcelain-coated grills before giving up and deciding to make their own out of top-quality stainless steel. They succeeded and today make the most popular and widely usef grills for sailboats. If you have ever seen a sailboat worn a grill chances are it was a Magma. Their success with grills led them to design cookware as durable as their barbeques. The result is Magma cookware systems. These nesting pot systems are made from the same top-quality stainless steel, come complete with non-skid pot protectors, have easily removable handles, are compatible with induction cooktops as well as propane, and most importantly have a non-stick coating called Ceramica that is Teflon-free. I wasn’t so sure that a Teflon-alternative would be any good, but we didn’t have many options. We headed over to Amazon.com and ordered ourselves a set. I almost didn’t because i thought the price was too high. When the Magma box arrived, my opinion changed. For the quality, they are actually very reasonably priced. These are not toy products like many RV-specific products that seem designed for very limited use. Instead these are professional- grade pots and pans rivaling the best cookware available. 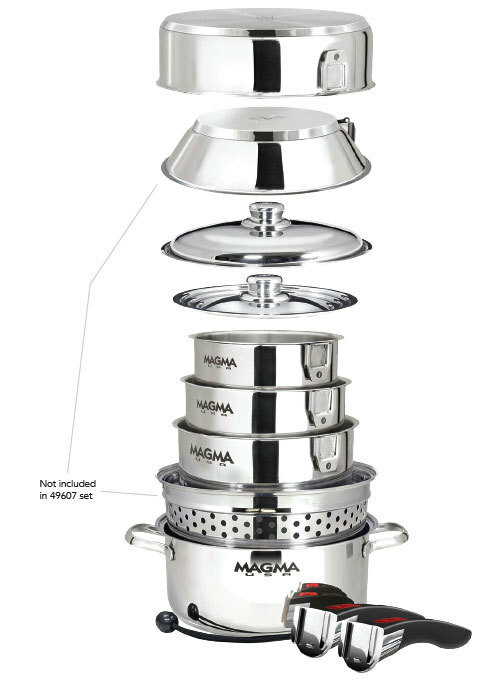 Magma Cookware has been selected for Practical Sailor Magazine’s “Gear of the Year and Editor’s Choice” awards and has been a recipient of the Good Sam’s Club “Product of the Month” award. Its easy to see why. The Ceramica coating works better than any Teflon I have ever used. Nearly every morning, Heather makes scrambled eggs and nearly every morning after that I wash the dishes. I wipe the Magma pan with a paper towel before I wash it to keep egg debris from going into our grey tank. The paper towel wipe completely removes the stuck on egg, no matter how crispy it gets. No scrubbing or scouring – the egg just comes right off. I’ve never seen a pan do that. And, after two months of daily use, the birds are still alive and still as feisty as ever. I still get excited about these pans! If you are planning to Live MoHo, do yourself a favor and get a set. They are quite a bit better than my Wolfgang Puck stainless pans and I would happily use them whether or not we have an RV.